On March 5, Shamsuddin Mohammad Fasal was as tense as the rest of his neighbors in Teldeniya, a village in Sri Lanka’s Central Province. A Buddhist crowd was advancing toward Digana, 5 miles away, to torch Muslim houses and shops. The mob wanted to avenge the death of a Buddhist man who was allegedly beaten by three Muslim men a week before. Rampant anti-Muslim attacks ensued, killing three people, injuring dozens more and destroying hundreds of buildings in the Central Province. The mob violence reflected the burgeoning divide between Sri Lanka’s Buddhist majority and Muslim minority, as well as the Islamophobia in other parts of South Asia, including nearby India. 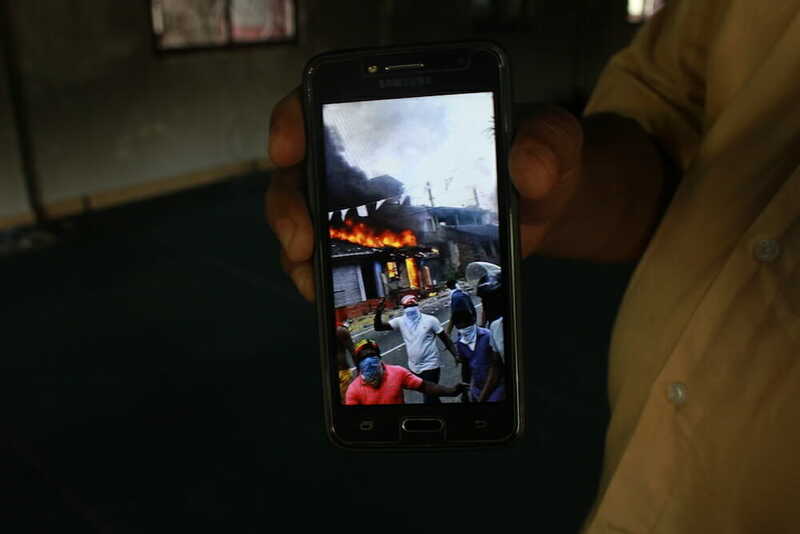 As the mob attacked Digana, Shamsuddin and his neighbors received forwarded text messages reporting Muslim men being beaten and the burning of their houses. “We weren’t sure where those videos were shot,” Shamsuddin said. Around 4 p.m., he received a video of a house on fire. “It took a few seconds to realize that it was my parents’ house in Digana,” he said. The two-story house sat prominently on A-26, a highway that connects Teldeniya with the city of Kandy. A shoe shop used to be in the front of the home, the living quarters behind. The building was up against a cemetery, on a small elevation covered in grass. Now, the house is nothing but soot. And to its right stands the half-burned Digana Mosque. 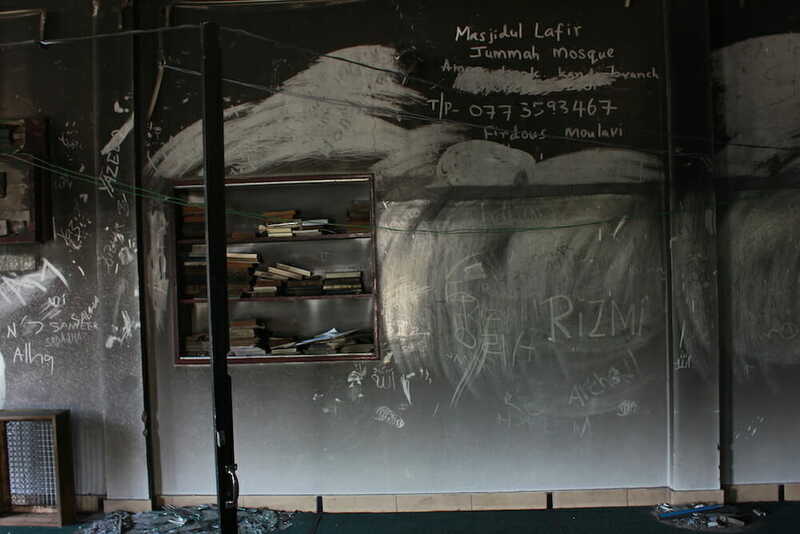 All through the week, anti-Muslim riots spread across several towns and villages of the Central Province. Four months later, the towns are limping back to normalcy. “But, it will never actually be completely normal again,” said Maulana Firdaus, the religious leader of Digana Mosque. Violence in Digana took three lives and demolished property worth millions of rupees. In the larger city of Kandy, mob assaults injured more than 80 people and destroyed about 270 homes and businesses. In many ways, anti-Muslim violence in Sri Lanka parallels the violence against Muslims in other parts of South Asia, notably India. In both countries, the minority Muslim population is feeling more alienated every day, according to Jayadeva Uyangoda, a Sri Lankan political scientist and constitutional expert. The divide between the majority communities and the minority Muslims is becoming so deep it may be impossible to bridge, Uyangoda said. But the most chilling similarity is that the state might be compliant in violence against Muslims in both countries. The acts of anti-Muslim violence in India and Sri Lanka share some important roots. “For one, they both rely on the majoritarian politics. … Both [have] majority communities perceiving a threat by a minority community,” said Uyangoda, who is currently a researcher at the Centre for the Study of Developing Societies in New Delhi. Hindus make up 80 percent of the population in India, and in Sri Lanka Buddhists make up 70 percent, but there is continual talk in both countries about minority Muslims taking over, Uyangoda said. However, the two countries have different contexts for the religious discrimination that exists today. In Sri Lanka, the context is that of a bloody civil war. The island nation still suffers the effects of that lengthy struggle, which started as a fight for linguistic equality and escalated into a war over separatism. A closer look at the war period reveals reasons for the depth of Sri Lanka’s religious conflicts. A potpourri of identities defines Sri Lankan citizens. The 26-year-long civil war (1983-2009) primarily was based on a conflict over linguistic parity between the two largest ethnic groups—Sinhalese and Tamil—but an underlying issue of religion also existed. While most Sinhalese are Buddhists, Tamils are Hindus, Christians and Muslims. The population of this island (about 25,000 square miles) is also divided geographically. The Sinhala-Buddhist majority resides mostly in the southern and western parts, and the northern and eastern parts have large populations of Hindu and Muslim Tamils. During the war, linguistic identity was of prime importance to the Sri Lankan state, but within the Tamil-speaking populations, religion was also very prominent. “We were never fighting the Sri Lankan state like the [Hindus and Christians] were,” said Shahul Hasbullah, a Muslim and a professor at Sri Lanka’s University of Peradeniya. Hasbullah was referring to the divide that occurred during the war between the militant Liberation Tigers of Tamil Eelam (LTTE) and the Tamil Muslim population. The Tigers supported separatism while many Muslims didn’t. So in 1990, the militant group drove out the entire Muslim population from the northern parts of Sri Lanka. Muslims of Jaffna, the largest city in the Northern Province, had to leave their homes within two hours after being ordered out. Hasbullah, whose family was forced to leave Tiger-held areas, is now studying the religious fault lines that intensified during that period. Shamsuddin Mohammad Fasal was studying in a madrasa (a college for Islamic instruction) in India when he heard of the rising Islamophobia in his country. “We were not accepted as ‘Tamils’ back then and were expelled from our houses. We are not being accepted as ‘Sri Lankan’ now,” he said. During the war, Muslims were also on the receiving end of discrimination by members of Sri Lanka’s majority. In 2002, Bodu Bala Sena (BBS), a Sinhalese Buddhist nationalist group, held a press conference on the increase in halalmeat (prepared as prescribed by Muslim law) in grocery stories. The pressure by the Sinhalese Buddhist nationalist group worked. Halal labels were removed from products on the shelves. The BBS occupies the alt-right space in Sri Lankan politics. “They are the on-ground violent operatives of the sangha, the Buddhist monastic community,” said a professor at the University of Colombo who requested anonymity. The BBS says it works for the benefit of all Sri Lankans but maintains that the country belongs to the majority community. A 2003 ruling by the Sri Lankan Supreme Court determined the state was constitutionally required to protect only Buddhism, and other religions did not have the same right to state protection. This ruling strengthened the BBS, according to Haniffa. The late Gangodawila Soma Thero, a Buddhist monk, spent the years before his death in 2003 preaching to the Sinhalese about how Muslims were going to outnumber Buddhists. Thero gave fiery speeches about how Sri Lanka is following the path of Indonesia, a country that used to have a significant number of Buddhists but now has the world’s largest Muslim population. Other right-wing leaders such as Champika Ranawaka joined with Thero in painstakingly discussing census figures to show it is merely a matter of time before the number of Muslims overtakes that of Buddhists. The reality in Sri Lanka is that Muslims constitute less than 10 percent of the population. When Shamsuddin returned to his homeland after the war ended, he felt a change in Sri Lankan society. The first reported attack on Muslims came in September 2011, when a mob demolished a mosque in Anuradhapura, a town in the Central Province. 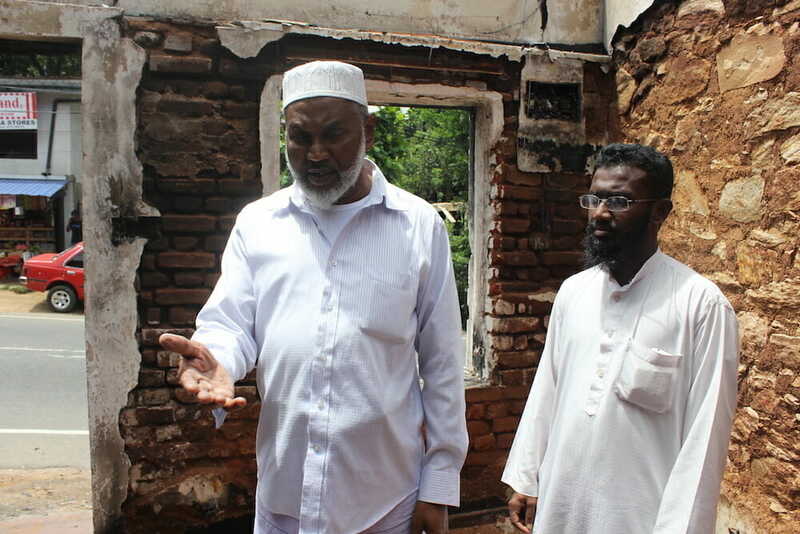 “The photos of the Anuradhapura violence and mosque burning down came gushing back to us when our own mosque was burnt down in Digana in March,” Shamsuddin said. 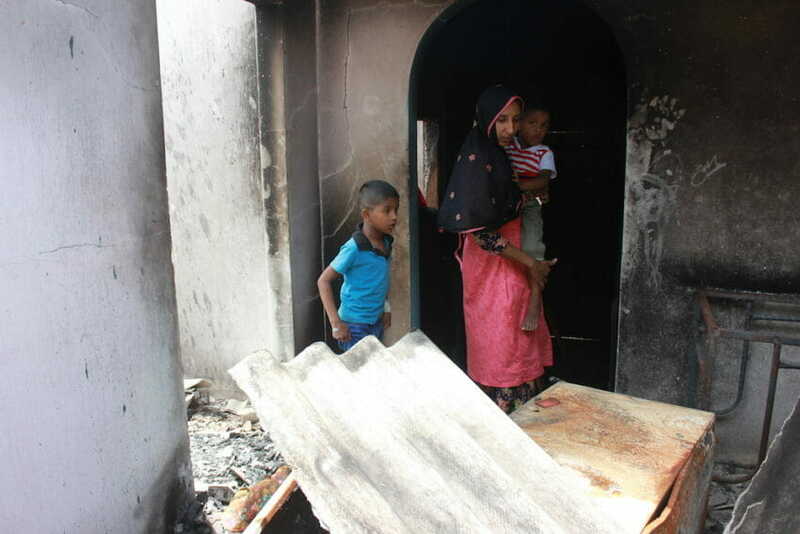 Other incidents of violence included anti-Muslim riots in June 2014 in the southwestern towns of Aluthgama and Beruwala. Days before the riots broke out, the BBS held rallies in the region during which anti-Muslim slogans were chanted. Four Muslims were killed, more than 80 were wounded and a mosque was burned down. According to official figures, about 8,000 Muslims and 2,000 Sinhalese lost their homes in the riots. Muneera Begum remembers the riots well. She was a postgraduate student when Aluthgama was burning. “I used to study in Kandy back then,” she said. “The riots were not our reality; we thought [they were] in some far-off town,” she said. It took only four years for the violence to reach Begum’s doorstep. In the recent Digana riots, her house was burned down. 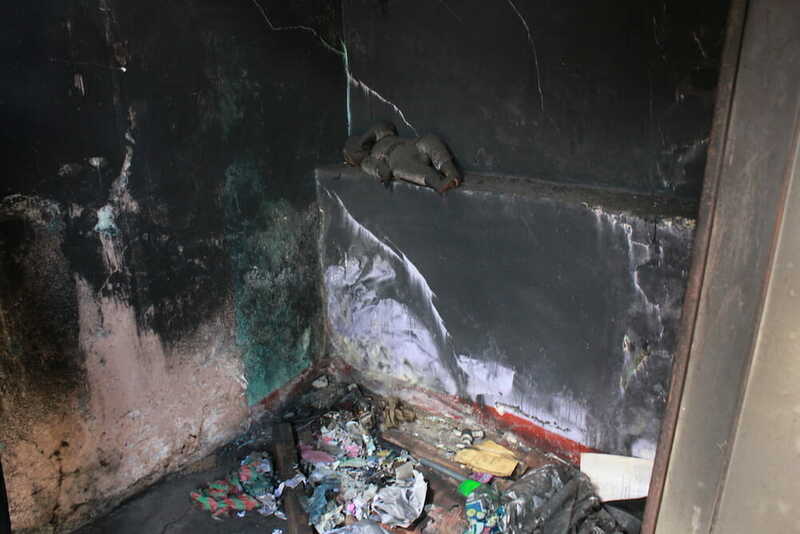 Begum, her husband and their three children lost everything they owned. “We have become like the Buddhist monks, with no possessions,” she joked. But her sad eyes were a giveaway when her 2-year-old son asked for his toys. Begum’s house was one of the two occupied by Muslims in a narrow lane filled with Buddhist and Christian houses. The mob that entered Digana pinpointed the Muslim homes for destruction. The other Muslim house belonged to a young man who, along with his friends, allegedly killed a Sinhalese Buddhist lorry driver. That was the incident that incited the mob to enter Digana. “The mob was angry at the [Muslim] boy who killed the Buddhist man, [but] why burn our house down?” Begum asked. “Therefore, now, we feel more secure if we live amidst ‘our own’ ” she said. 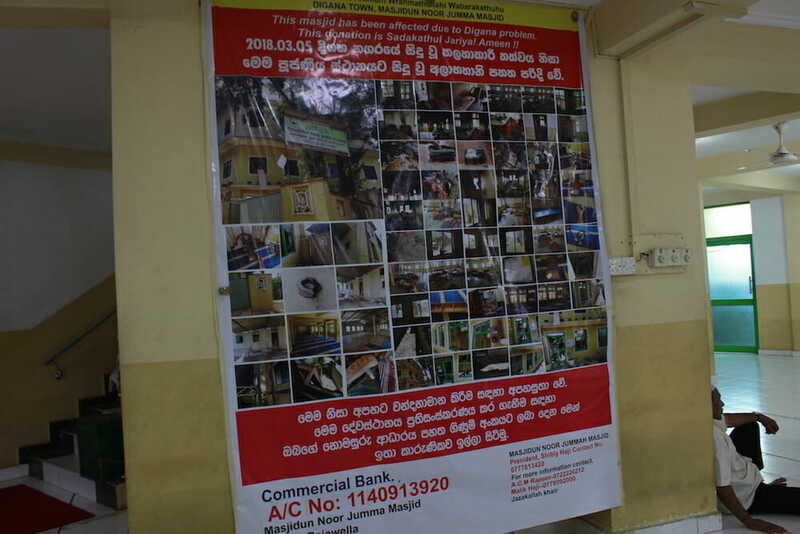 In some areas of Sri Lanka, including in the capital, Colombo, Muslim ghettos have been emerging. But before the March attacks, many Muslims in the Central Province seemed to be comfortable living among the Sinhalese and speaking both Sinhala and Tamil. “We assimilated well,” said Shamsuddin Mohammad Fasal’s other brother, Shamsuddin Fayaz, whose legs were burned severely in the family’s deadly house fire in March. “But when you see your neighbor turn against you, I wonder why we should not assert our identity,” he said. Begum also supports asserting Muslim identity. She said she did not wear the burqa a few years ago, but that changed when her brothers took up religious education in nearby mosques. Previous PostWho will benefit from the latest proposed amendments to the RTI?